There's More than One Way to Grow a Cockscomb! | Gardens Alive! A. Now, those of you who have emailed us questions in the past know that if you don't specify it up front, we always email back and ask your location. So (no peeking now)—where do you think Colin might be writing from? One of our big listenership areas, like Philadelphia, Dayton, Oklahoma…? Colin's response: "England; specifically St. Albans in Hertfordshire", which MapQuest reveals is up near Leeds; and which means that Colin has to find his own plants! I checked with Don Zeidler from the W. Atlee Burpee seed company here in the States, and he doesn't know of any American suppliers that ship overseas. The regulations are really strict and the expense would be prohibitive. 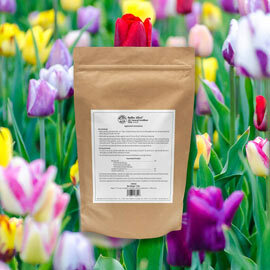 But the UK has many fine seed suppliers, and once we help Colin better understand exactly what he's looking for, he should be able to achieve his goal—especially if he has the ability to grow plants from seed. …Because I don't think the chances are good that he can find what he wants already started at a garden center—even though we're talking about a really popular summertime bedding plant. Cockscombs, with their beautifully colored spikes of red or orange flowers at the top, are in a lot of gardens, right? 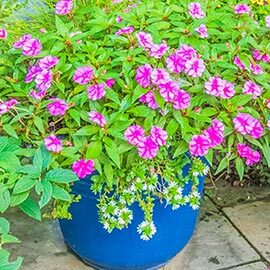 Yes—but, in my experience, garden center plants mostly tend to be compact varieties, bred to stay about a foot or so tall so that they'll fit in well with other bedding plants. But many catalog companies carry seed of varieties that can reach almost three feet. So if Colin is willing to start with seeds, he can probably grow taller plants than a local garden center will carry—but first he has to figure out which kind of 'cockscomb' he wants. That's right—there's more than one kind. "Cockscomb" is the common name for a species of Celosia—and really the only species in a pretty big genus that's grown commercially (Celosia argentea). But this single species has two radically different 'forms'. We American gardeners are mostly used to seeing what's known as the "Plumosa Group", with tall, erect 'plumes' of brightly colored flowers—what most people to expect to see when they hear the word "cockscomb". But true cockscombs are members of what's called the 'Cristata' or 'Crested' Group, and they have a completely different flower head. It's kind of wavy, looks a bit like a flattened-out section of brain, and apparently, someone influential once decided it resembled the 'comb' on a rooster's head. But Colin only said 'cockscomb', and because that term has become so generic for garden Celosia, we really don't know which kind of plant caught his eye. He might want big plumes instead of squishy brains. Luckily, in a garden center the plants will be blooming, so he'll see which kind they are. And here's where I think Colin's location brings him a little bit of added luck. There is such a high concentration of extremely enthusiastic gardeners in England that's there's likely someone nearby with the right skills—and probably even a greenhouse of some kind. The summers in England are cooler than ours, and in most regions you need a greenhouse or some other kind of structure to grow things like peppers and tamatas (or over there, 'Toe-mat-Oes'). I've never personally started Celosia, but 'the book' says that the seeds need to be exposed to light, which is always a little tricky. And the germination time is listed at 14 to 21 days, which is two to three times longer than things like marigolds or tomatoes . And that's just one variety. There are a lot of other tall ornamental amaranths that have huge seed heads—and in the same color range as cockscomb, which isn't surprising as Celosia is actually a member of what's called the 'Amaranthus' family. So if our listener can't get the height he wants in a cockscomb, he should try an ornamental amaranth—they're just as big a show stopper in the garden.